You love a clean home but hate all the nasty chemicals that go into conventional cleaners? Ecover might be for you! You get products free of harsh chemicals, like ammonia, bleach, foam boosters and optical brighteners, that can damage both your health and the environment. You enjoy great, natural, plant-based scents, as there are no synthetic fragrances in Ecover products. You keep your carbon footprint low, as Ecover products come in packages made from recycled plastic, plastic reclaimed from sea water, or Plant-astic, a petrol-free innovative plastic. You can be sure that no animals were hurt to test or produce your cleaning products or their ingredients and Ecover even supports the Fund for the Replacement of Animals in Medical Experiments. 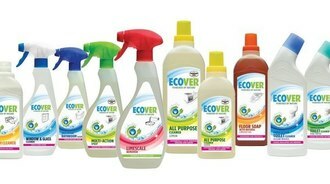 Ecover has earned the European Union Eco Label. All products biodegrade fast and completely and environmental specialist evaluate the whole life cycle of all the products, from production to consumption and disposal. Ecover uses the Diamond Model, an evaluation system consisting of 13 criteria, validated by the independent authority Vinçotte Environment, in order to ensure top quality for all its products. What's more, Ecover has an enthusiastic Research and Development team that works hard in order to find innovative ways to make production even more sustainable. Intrigued? Then check out their wide product range, suitable for vegans and vegetarians. Ecover products are packaged in recycled plastic reclaimed from sea water.